← a couples shower for baby H! 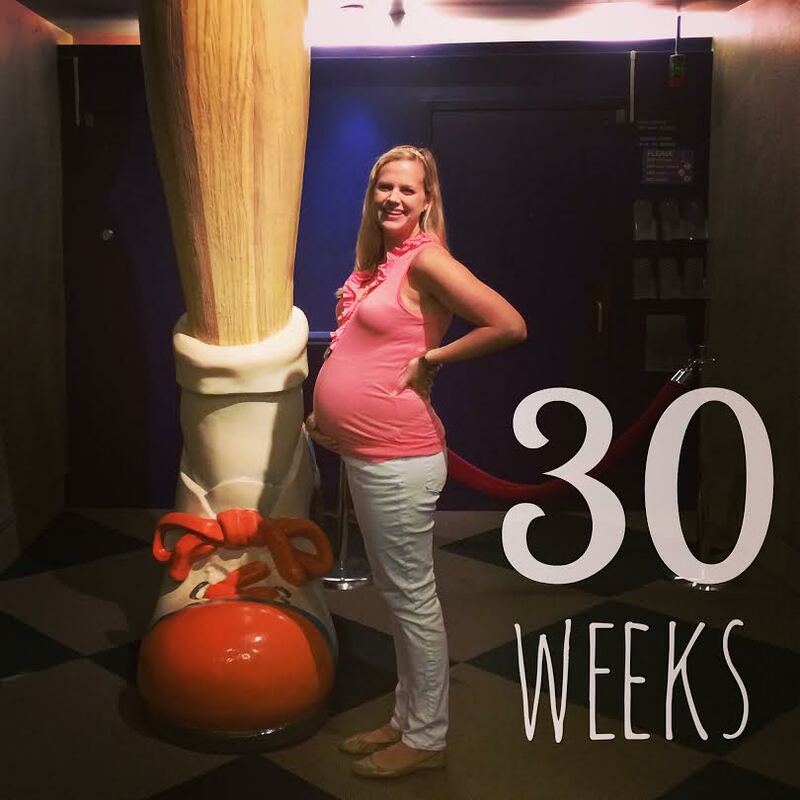 # weeks: 30 — baby is the size of a large cabbage! Measuring approx 17″ long and weighing about 3.1 lbs. I’ve been working at the Center for the past 9 (!!) years, so it’s only fitting that I’d take a bump photo here. The giant Pinocchio legs crashing through the ceiling outside of the now closed Museum exhibit are an iconic photo spot at the Center, and I’m glad I got this before our expansion and new Museum open this fall! Best moment this week: Celebrating baby H at our couples shower in Nashville last weekend! We felt so loved and are now even more excited for her arrival in just a couple short months! Miss anything: It’s getting almost impossible to tie my own shoes now… hope Craig’s up for the job! Cravings: With the amount of chicken salad sandwiches I’ve consumed over the past 7.5 months, there’s a chance she might actually turn out to be a chicken! Feeling good/bad: Feeling good, but definitely getting more tired walking longer distances and up the stairs. Also, I am pretty sure baby decided to run a marathon and take a kickboxing class while I was trying to go to sleep the other night… I was slightly worried she might actually kick her way out of my belly! 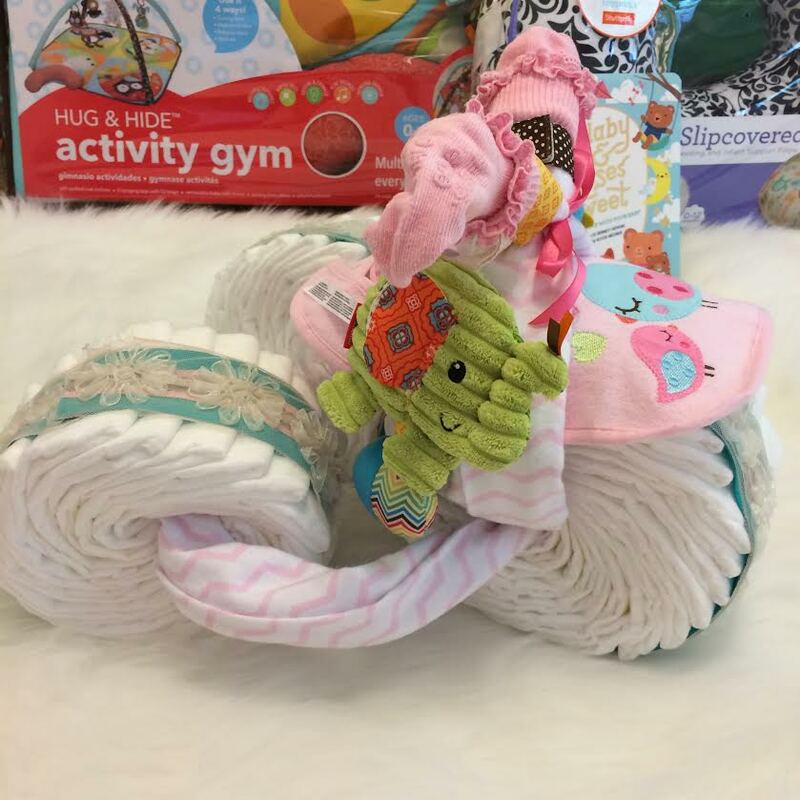 Baby purchases/gifts: Our friends and family were so generous at our couples shower, and we received everything from clothes, animal wubbanubs, and a bike made of diapers, to a humidifier, boppy pillow, baby carrier, and activity gym. We loved receiving the book “Good Dog Carl,” which is about a “responsible” Rottweiler who babysits his tiny human while mom is away. I can’t help but laugh to think of Coco doing the same thing! Looking forward to: A weekend at home celebrating the 4th of July! We have plans to try out a new restaurant and see Jurassic World, spend a lot of time in the pool, hang out with friends, and shoot off some fireworks. I’m really looking forward to a relaxing weekend at home after the whirlwind month we had in June. It’s crazy to think that for this holiday weekend next year, we’ll have an almost 1 year old on our hands!